When the weather outside is frightful, it’s difficult to find the motivation needed to do daily activities, like head out to the grocery store or pick up the dry cleaning. Staying inside where it’s warm and cozy, where you can hunker down on the couch under thick blankets sounds much more appealing, doesn’t it? If completing weekly tasks is hard throughout the winter months at times, so is maintaining the right level of physical fitness. If you can’t get outside for your daily walks or bike rides because of frigid temperatures or icy sidewalks, what can you do to ensure you’re getting the exercise you need to keep you healthy and strong? Let’s find out together! Exercise offers a variety of health benefits to seniors, like strengthening muscles to increase stability and reduce the risk of a fall. Getting your heart rate up daily improves the cardiovascular and respiratory systems. Additionally, exercise helps speed up the healing process and prevents some chronic conditions like osteoporosis or diabetes. This is why it’s so important not to drop your fitness routine just because the temperatures have. The key is to find some activities that can be completed indoors until the spring thaw hits and you can get back outside. Modify outdoor activities for the indoors. Love biking? Try a stationary bike. Do you normally take a walk around the neighborhood every afternoon? Go to a local mall or shopping center and walk a few laps around the perimeter. Look into a gym membership. Joining a gym is a great way to stay active throughout the winter while also staying warm! You’ll have access to a variety of workout equipment, and some gyms even provide personal trainers to ensure you’re reaching your goals with individualized exercise programs. As an added bonus, you’ll have the opportunity to meet new people and make new friends along your fitness journey. Take a senior fitness class. Looking for a specific type of workout class? 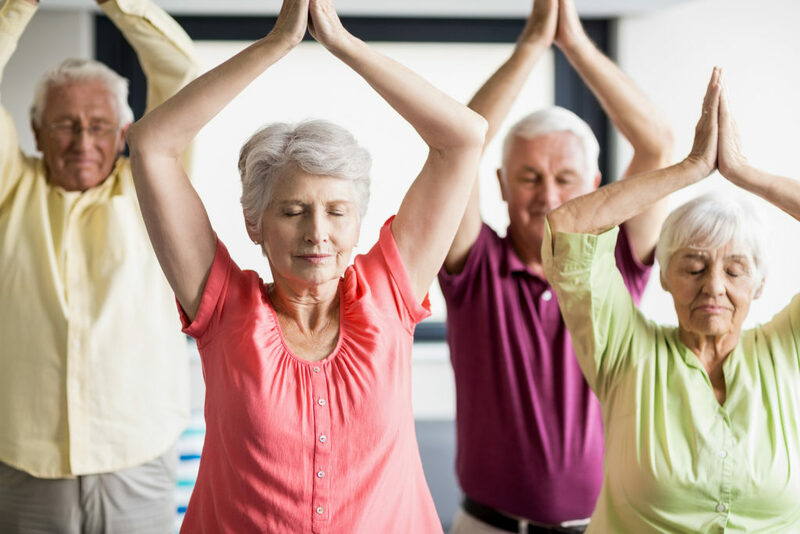 Most local fitness centers offer fitness programs with the specific needs of seniors in mind such as yoga, Pilates, strength conditioning and water aerobics. Locally, you can check out fitness centers like Montana Athletic Club in Big Fork, Flathead Health and Fitness, and Rockfish Fitness, just to name a few! Discover a new home workout. If you’re really set on staying within the comfort of your home, that’s okay, too! There are plenty of home exercises you can do right in your living room, and most don’t involve any special equipment besides a DVD player. You can try yoga or Pilates, for example, which are both low-impact workouts that strengthen your core and improve your flexibility. Play games with the grandkids. Kids are always bustling with energy, so when all else fails, spend time interacting with your grandchildren. Ask them to teach you how to use their video game consoles, especially those like the Nintendo Wii or PlayStation Move which get you up and out of your seat, virtually playing sports games like bowling, golf or tennis. At Immanuel Lutheran Communities, we focus on all six dimensions of wellness through a variety of healthy activities for residents. For your physical health, you’ll enjoy access to daily fitness classes designed with the specific needs of seniors in mind. Improve your strength and balance, try yoga or even dance your cares away in a line dancing class. Contact us to learn more about the offered at our Kalispell retirement community located in the beautiful Flathead Valley.